Share this article with your network and spread the word about The Territory. Raylene Brown spent a lot of time on the road with her parents growing up. They travelled across northern Australia wherever work took them. But no matter where they went, a love of native food went with them. Traditional recipes were handed to Brown, and over time, she mastered them. This would seal her fate as one of the most respected bush food caterers in the Northern Territory. Born in 1964, Brown has lived in Alice Springs, Darwin, Tennant Creek, Katherine and on remote stations. Though she’s visited major cities, she’s always been pulled home. “I’m definitely a Territory girl,” she says. Kungkas Can Cook, Brown’s indigenous catering business, was established 18 years ago. “I’m lucky to survive that long in a small town … it’s because I do a few different things in my kitchen, not just normal catering,” she explains. It’s not a business that can be replicated elsewhere. 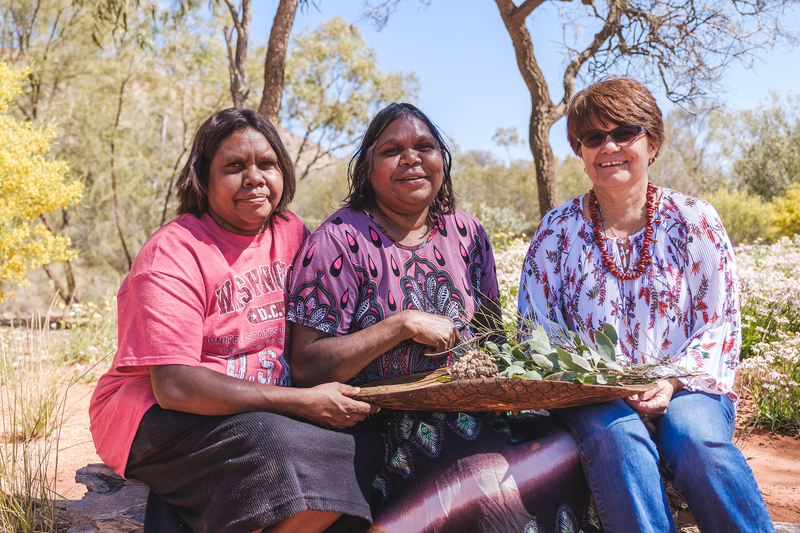 It relies on the distinct Northern Territory surrounds, the ingredients that are grown nearby and the indigenous community members that understand what hospitality means in this part of the world. From the beginning, “bush feeds” were on the menu. Brown has local indigenous women to thank for the inspiration. “It was the old ladies in the bush saying you’ve got to cook kangaroo tail. You’ve got to have kangaroo stew, you’ve got to have kangaroo on your menu,” she recalls. Few local chefs believed this was a wise business move, many telling Brown she was crazy. Almost two decades later, she’s proved the critics wrong. Her work is about far more than being successful in business, though. It’s about honouring the past, telling important stories in the present and ensuring that indigenous tradition has a firm place in the Northern Territory’s future. Those considering working in the Northern Territory can learn plenty from Brown. “I was a leader in my community. I was one of the first indigenous businesses to start here. Now people are coming to me to ask me advice,” she says. It’s easy to see why her thriving company continues to grow. Tourism is evolving. Visitors want that “get off the bus, put your feet in the dirt, and listen to a story” kind of cultural immersion. And Brown delivers. All of the produce is locally harvested by women working on the land. “Every seed, every berry has been lovingly handled and processed, ready for market,” Brown says. And while harvesting, the women sing, their connection to country is undeniable. The tradition has been passed from generation to generation. “Our ancestors respected mother nature, the land that we walk on,” Brown says. The respect for the earth and the food it bears is an essential part of the Kungkas Can Cook philosophy. “For me, it’s not just a food, it’s got so many connections. That’s how indigenous people learn. We learn visually, through song and through oral history,” Brown says. Meals served here satisfy the human need to eat, but they’re also a reflection of a way of life. So her customers – both tourists and locals – are served the stories behind the dishes, too. “I’m so happy that I can adapt what happened in the past to be something that could be a part of my business every day,” Brown says. The potential for bush foods across Australia is massive, Brown explains. She’s quick to point out there’s no desire for the fruits, vegetables plants and seeds to become a mass agricultural products, but passionate producers and hospitality professionals have an opportunity to help improve processes. There are no tractors or machines to lighten the load of women working tirelessly. Brown has incredible respect for their hard work would like to see them supported with trays where they can store more produce or access to reliable vehicles. The demand for authentic experiences, a slower pace and a variety of job opportunities is also drawing people to stay beyond an initial visit, Brown believes. The increasing presence of young families is among the most notable changes she’s seen in recent years. There’s an idyllic lifestyle that the major cities can’t always provide. “The Territory is opening up to become more accessible,” she explains. To those considering a new way of life, Brown believes relocating to the Northern Territory is a “great move”. With new stories, tools, resources, events and more being added regularly, sign up to hear the latest as it happens.